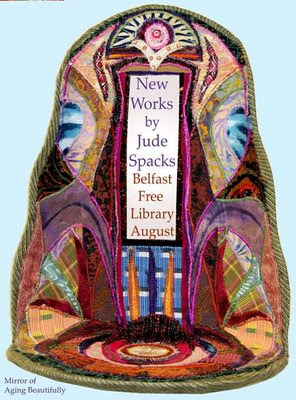 As you come in the door to the Belfast Free Library, directly across from you next to the elevator hangs this Portrait of Rodney Dennis. 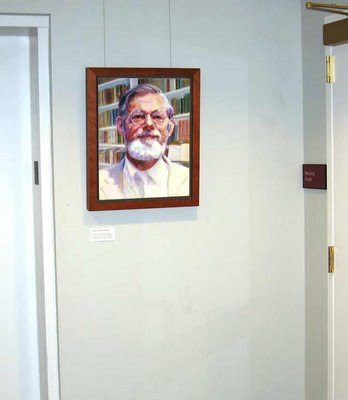 Rodney Dennis was Manuscript Librarian of Houghton Library. He lived in Cambridge, MA and Union, ME. 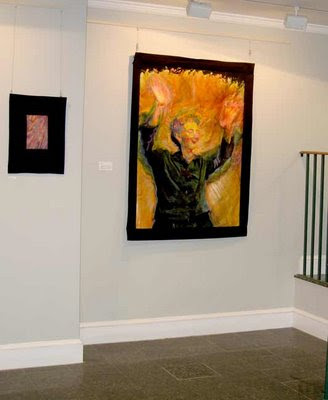 Thanks to Christie Dennis for commissioning and loaning the painting. Across the room, you'll probably notice first the big picture called What Is, of Kathleen Hannan, conducting singing up to a high note at an interfaith celebration. 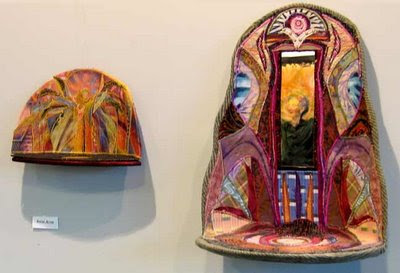 ...before you see that right next to you, as you still stand by the door, is a wall of little mirrors, ending with a small angel altar on the left. 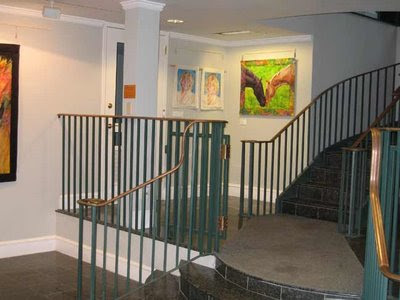 At the right side of this wall is the artist's statement. Want to read it? 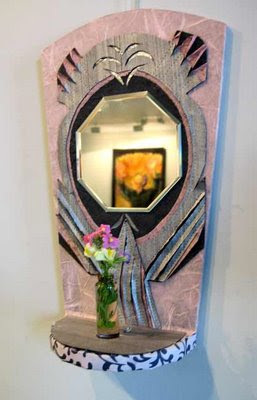 The first two (glass) mirrors have little vases inset in front of them, with an offering of a few small flowers. They are both called Made Mostly of Water, like the flowers are. If you look into them, you might consider that you are part of that same flow and freeze and melt, the drops and waves of life. These two pieces were very loosely inspired by the photos of water crystals exposed to a variety of concepts, in Masaru Emoto’s The Hidden Messages of Water. They're roughly 12" high, made with layers of handmade papers, some sewn together and then cut with a chenille cutter and raised in grooves. The one directly above has composition silver leaf crumpled and inset at the top. 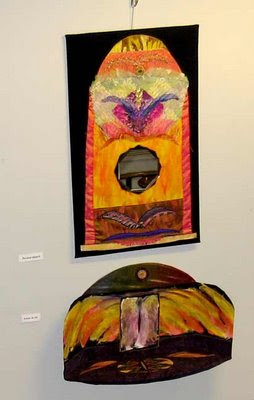 The piece in the middle is called Mirror of Transition. When my soul-sister died, I traveled out with her into the night sky. I heard myself say, "I'll go with you a little way, Joanne" as I lay in bed miles away. I experienced an indescribable sense of expansion, spaciousness, peace and awe. The next morning I learned she had passed at just that time. Maybe 20 years ago Joanne gave me the piece of black lace with shot through with shiny hot pink threads that veils the mirror. (The post Anger tells one small story of what I learned from her). 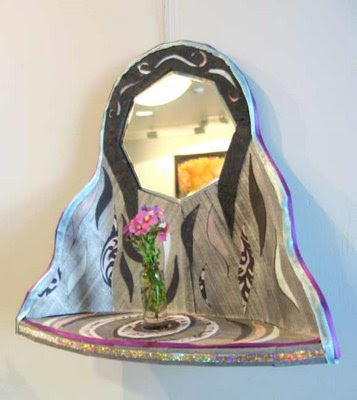 The veil refers to the Jewish tradition of covering mirrors after a family member has passed. As you look at yourself through it, you may see a mystery. Every transition is a little death and ascension to a new and unknown form, or into formlessness. 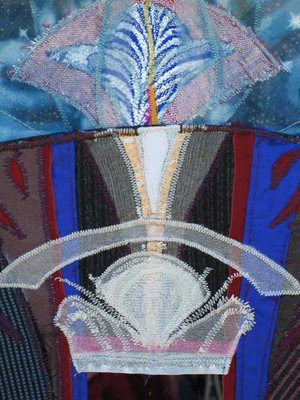 This piece has layers of transparent and semi-transparent fabrics; it tiers back and back as you look through, into an undefined light essence rising, a distant evocation of that moment of letting go into transformation. Or, that's what I was going for. What's it like for you? Here's a detail of what's under the veil--a small advantage of a virtual tour, since I know in person you would never pick up the veil to peek, it's very delicate. Next comes Mirror of Aging Beautifully. Look in--obviously, you are (aging beautifully--admit it!) Here the mirror reflects the What Is picture across the room. To the left, the little angel altar; you can barely see the composition gold leaf inset center focus in the shelf from this angle. 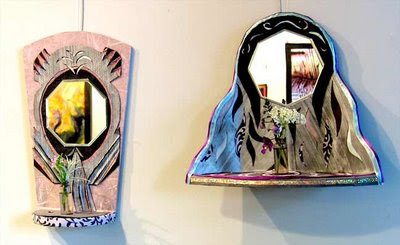 It's intended as a magic mirror, like the ones in fairy tales--"Mirror, mirror on the wall..."
Let's take a quick look at the opposite wall, shall we? This one, Inner Reach, is a particular favorite of mine. It's a new departure for me to show more abstract pieces like this. 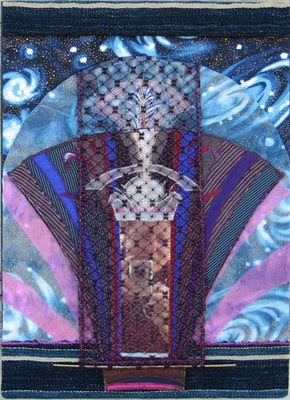 It's done with fabric paints on canvas, and colored pencil, sewn onto a heavy dark blue denim backing. I like how you can't really tell what's on top of what, but you wind up with an impression of depth or spaciousness, full and open at once. Maybe it evokes an enlarged section of an imaginary scan of your mind...or maybe not. This one at the left corner is called Stick With Love. 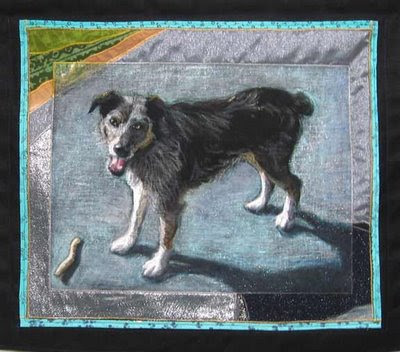 The story behind the piece is in Dogged Dedication. 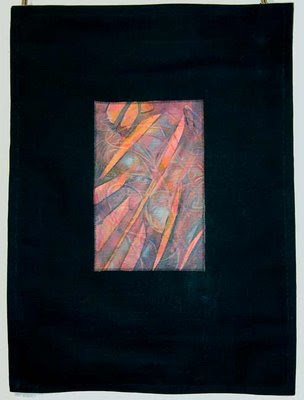 The image was done with pastels and glitter on black fabric, the border, with fabric applique. 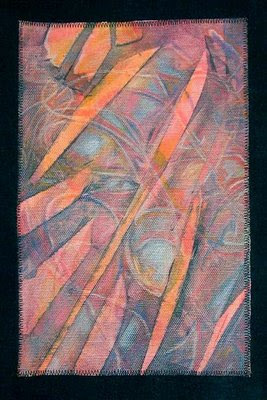 An theme of the show is experimentation with ways of combining fabric art and painting/drawing. I worked primarily in representational fabric collage for 25 years and then returned to painting where I started, in oil portraiture. So I'm interested in how to integrate the different media. Oh, one other thing. Yes, most of them are for sale, but since it's a free library, the prices aren't mentioned on the wall, and there's not even a price list out. 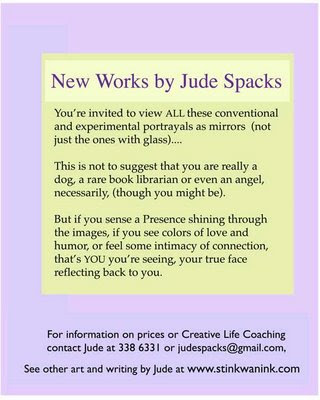 But if you see one that might be for you, send me an email at judespacks@gmail.com and I'll be glad to tell you more about the piece, and the price. Hey, thanks for looking and reading so far! Seeya later.